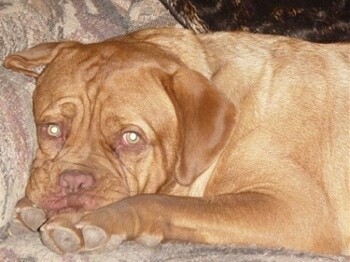 "This is my Dogue de Bordeaux puppy at 4 months old. His name is Diego. 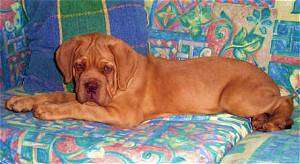 I live in Toronto, Canada, and got him from a breeder about a 3-hour drive away in Chatham, Ontario." "He weighs about 45 lbs. 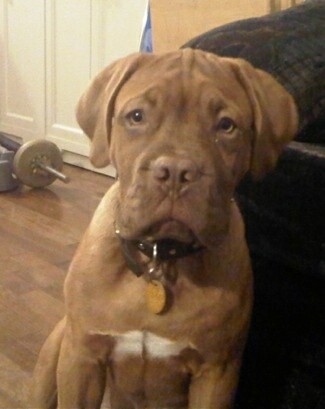 in this picture and is growing by the minute! 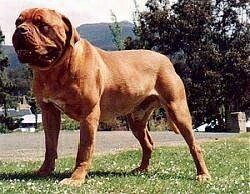 He has a great temperament, very friendly and curious. He is super confident and will head into the unknown without fear. 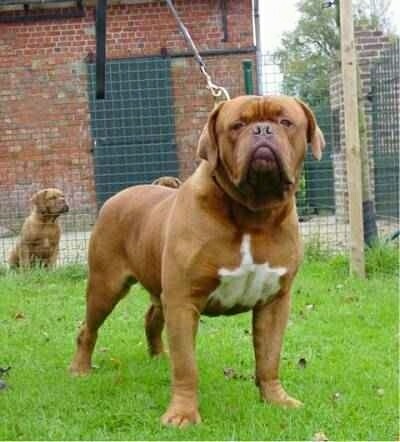 He is not aggressive at all but he is very stubborn and tends to push the “pack order” often. I have tried to be as consistent as I can be with my training and with demonstrating that I am the pack leader. He was the most adventurous and lively from his litter and was first to feed and first to jump on and play with his littermates so I knew he would be a handful when picking him." 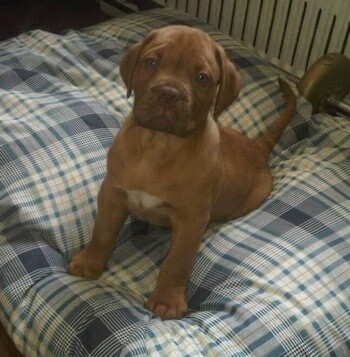 Diego the Dogue de Bordeaux puppy at 8 weeks old—"He learns very quickly and already knows how to sit, lie down, heel, shake paw and bark on command. The challenge hasn’t been teaching him, the challenge has been getting him to do it when I ask, like I said before, he can be very stubborn! He requires a fair bit of exercise. I take him to the park daily and get him to run around. We play chase games and hide-and-seek. Now that he has all of his shots he’s been to the dog park quite a few times. He does very well with other dogs, respecting the older dogs that want to be left alone and playing only with the dogs that reciprocate his excitement. He has been enrolled in a puppy socializing class, which he started at 12 weeks. It was very important to me to get him to be exposed to dogs and different kinds of people at an early age and it has really paid off. "I have been following all the tips and tricks on the website as well as what I’ve taken from watching Caesar Millan on the Dog Whisperer. I know there is still a lot of training and growing to do but so far it seems to be very helpful. 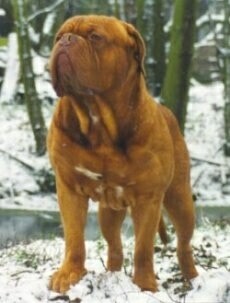 I would recommend anyone read his books and read through your website, especially with a breed like the Dogue." 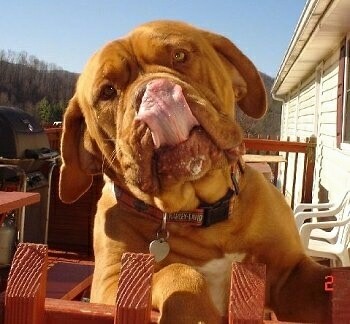 "Kona is a rescue dog, as his owners abandoned him when they moved. When Rott'n PAWS Rescue got him he was 20 pounds underweight and dehydrated. Despite his previous neglect, he was very sweet but a little shy and aloof. In the past few months Kona has really come out of his shell. He's much more comfortable showing affection, as he now enjoys snuggling on the bed. He LOVES to play with other dogs, swim at the lake, and is the newest member to our local Schutzhund group. He is currently about one year old and 100 pounds. His nickname is Pigpen—he drools a bit, lloves to run around in the yard like a two-year-old boy and then come into the house and share his dirt. Everyone who meets Kona ends up loving him in mere minutes." 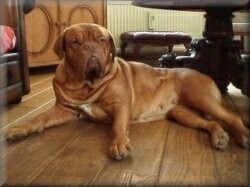 This is Diva, a four-year-old Dogue de Bordeaux. She is cleaning her own drool off her face so you will pet her. 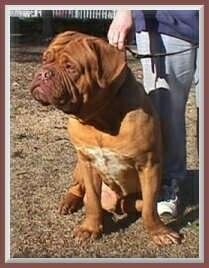 This is Truck from Back Country Dogue de Bordeaux's. 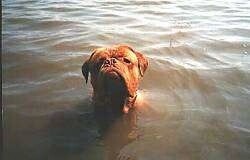 Donar loves to swim. When he is tired he just sits in the water to rest.